Many a garage band musician dreams of making it big, and some even achieve a modicum of success getting as far as playing a number of local bookings. Many of these musicians are typical rhythm section players – guitarists, bassists, keyboardists, as well as vocalists – but how many are virtuoso level, classically trained violinists? 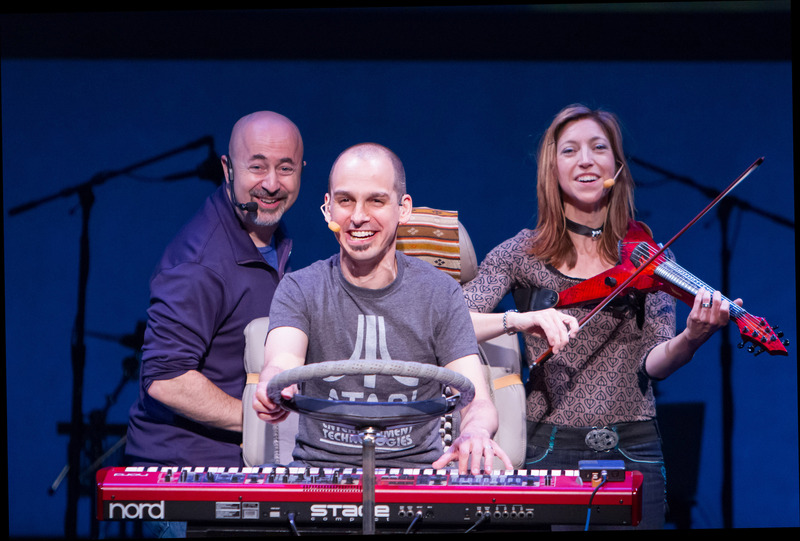 TheatreWorks finishes its 42nd season with its 60th world premiere: GrooveLily’s Wheelhouse. This isn’t a typical musical. It’s a pop/rock/country/fusion concert with a significant storyline running through it. Wheelhouse is a memoir and chronicles the journey the members of the band took together including touring for 11 months in an RV to get to their “Day of Reckoning” – the line in the sand when they made their commitment to each other for the continuance of GrooveLily. A bit of history: After a stint as an Army officer, and later touring the world with many notable popular artists such as Cyndi Lauper and Joe Jackson, Valerie Vigoda started The Valerie Vigoda Band in 1994. Over time, the band evolved from a 7-piece ensemble ultimately to its present form as GrooveLily, a trio with the classically trained Vigoda at its core playing her six-string electric violin and singing, often simultaneously. Her long time collaborator (and later husband) Brendan Milburn on keyboards and vocals, and Gene Lewin on drums (and guitar, banjo, vocals, and occasionally keyboard) round out the band. The three also form the creative team for developing their new material from script to song. What makes this band different from most other bands is that while they do play concerts; their focus is really on a musical theatre style utilizing the concert setting. The show opens with a typical rock concert beginning, the three musicians taking the stage, manning their instruments, and singing “Can You Believe”, a song of accomplishment about how far they’ve come. They greet the audience mid-song, and then they quickly segue into a retrospective, “We’re in a Rock Band”, a song that really sets the tone for the story to come. After several years of short tours while maintaining day jobs and homes, Brendan comes up with the wild idea that they should dump the homes, get an RV, and spread their special brand of music nationwide by touring around the country. Their song “Take on the World” is innovative, the three of them sitting at a table with a computer and phones “discussing” the idea. The primary instrumental accompaniment on this one comes from the clicking of computer keyboard and phone keys, and telephone tones. Not quite ready to cut all strings, Gene keeps his day job as a tech consultant contacting his clients from the road via his cell phone (good thing they decided to do this in the 21st Century). There are several touring songs about the highways they traverse, logistics of life on the road, and the realities of trying to make a living playing in a range of venues from churches to school gyms or classrooms and even a laundromat at one point. While the entire show is autobiographical, some of the events are compressed or extended to fit into the targeted timeframe during the 11-month tour. As a story, it’s fascinating. The music is smart, funny, and inviting, the lyrics telling the story from the inside. The songs are fully written out, more akin to classical music than rock or jazz, but then the three also improvise within a tight framework, and the result is exquisite. All three are consummate musicians, their fingers expertly flying and landing with great precision. Vigoda is masterful in her playing, dipping into classical and jazz riffs along the way, and even adding a touch of country on occasion. Her singing is spot on, smoothly transitioning from a belty rock style to a more bel canto head voice, and it’s impressive watching her play complex patterns on the violin while singing, and in a couple of key moments in the story, dancing as well. Milburn is an accomplished keyboardist and vocalist. He expertly plays a variety of rock and jazz styles on several keyboards around the stage including standing at the keyboard at his “home” station, sitting in the driver seat in a RV simultaneously hanging onto the steering wheel and covering a keyboard, and even roaming the stage singing and dancing while playing a keytar. Lewin primarily covers vocals along with drums and percussion on a standard drum kit and on a variety of “instruments” such as a table top, a phone pad, and even his kneecaps at one point. Being a versatile instrumentalist, he also switches off to acoustic guitar, and he even takes a short turn on Milburn’s keyboard. His vocals are pleasant, but he occasionally attempts to sing above his range and briefly fades out. Music runs through the entire show. Using the music and short book segments, the story achieves a nice balance between personal emotion and storytelling even though the trio members are largely playing themselves along with other minor roles to cover some of the people they encounter along the way. Because the script kept changing throughout the rehearsal period, the three momentarily stumbled on a few lines, but as skilled actors in addition to being musicians, they covered well on opening night. Though self-involvement and discomfort with some of the included events were initial concerns in developing the script, the story is intriguing and stands well on its own. As such, the show could be performed by another cast of three provided its members possessed the requisite musical and theatrical skills – a tall order to be sure. The set has theatrical and technical appeal and uses three projection screens showing slides or short movies detailing the ideas being discussed or sung about. One very funny slide sequence has a mobile pie chart split into seven pieces including: “worry”, “fun”, “booking the band”, “song writing”, “feeling old”, “practicing”, and “promotion” all constantly changing percentages as the discussion progresses. There are initially three performance stations set on mobile platforms for drums, keyboard, and violin, each with a computer controller (two using Ableton Live to enhance instrumentation and the third with a Linux-based virtual receptor feeding Milburn’s wireless keyboards through the sound system). The platforms are moved remotely to facilitate set and prop changes during the performance. Above all, Wheelhouse is a delightful ride through GrooveLily’s adventurous beginnings and shouldn’t be missed. For additional background on GrooveLily and the show, see www.groovelily.com. When: Wednesdays – Sundays through 1 July. See www.theatreworks.org/shows/1112-season/wheelhouse for more information or to order tickets. ← Will family ties survive the truth? got here on this post. I will likely be coming again to your blog for more soon.